One of the best places to spend a summers afternoon in Kyoto is the balcony at Kiyomisu, the temple high up on the mountain sides overlooking the city. Enjoy a quiet beer to quench the thirst and simply watch the world go by. The walk up from the center of town is an adventure in it's own right but it's the destination that makes the hike worthwhile. Today the deck is the haunt of tourists but in the past it was the stage for artists to entertain the crowds. A fair few of whom are reputed to have become a little too enthusiastic and managed to plunge over the edge into the depths below. 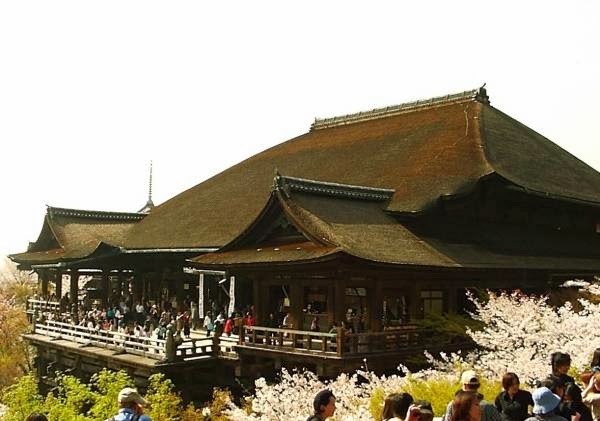 And from this arises the phrase "Kiyomizu no butai kara toni oriru tsumori de" meaning to jump from the deck of Kiyomizu Temple (intentional or not). A more colloquial translation though reflects the moment of working up the courage to take the plunge (assuming intent), or more simply "a leap of faith". Something else to ponder as you enjoy that ice cold beer.